Siddhartha Mukherjee has a written a biography of the gene as deft, brilliant, and illuminating as his extraordinarily successful biography of cancer. 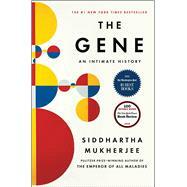 Weaving science, social history, and personal narrative to tell us the story of one of the most important conceptual breakthroughs of modern times, Mukherjee animates the quest to understand human heredity and its surprising influence on our lives, personalities, identities, fates, and choices. As The New Yorker said of The Emperor of All Maladies, “It’s hard to think of many books for a general audience that have rendered any area of modern science and technology with such intelligence, accessibility, and compassion…An extraordinary achievement.” Riveting, revelatory, and magisterial history of a scientific idea coming to life, and an essential preparation for the moral complexity introduced by our ability to create or “write” the human genome, The Gene is a must-read for everyone concerned about the definition and future of humanity. This is the most crucial science of our time, intimately explained by a master.